Think you’ve packed on some pounds over the holidays that you STILL can’t get rid of? We’ve all had that problem. But, sometimes, it’s worse for some than others. And this little guy had it worst than most. At least he had the police looking out for him? Who’s looking out for your health? 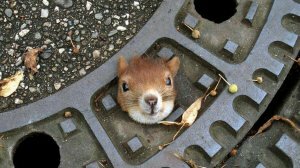 So, if you don’t want to get stuck in a manhole cover, you’ve got to make good decisions with your diet. You’ve got to exercise more. And, you’ve got to get all the nutrition that you need. And LiquiVive® Liquid Vitamins provides that. That means that you can take one fluid ounce of LiquiVive® Liquid Vitamins. Sometimes Life Poops On Your Car.